Hull weight (approx.) 1300 lbs. Fresh water capacity 35 gals. Hull type: Full length deep vee with 18o min. deadrise, bulbous keel section, and lift strakes. Hard chine hull, developed for sheet plywood planking. 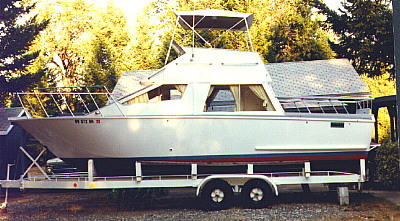 Power: Stern mounted inboard motor connected to an outdrive or vee drive. Maximum motor weight with outdrive: 850 lbs; with vee drive: 950 lbs. Reduction gear may be required, depending on engine. Can the hull be extended or shortened? Extend: No. Can be shortened up to 10% by re-spacing the frames from the aft end of the stem to the transom a proportional amount. We do not recommend increasing the beam. Trailer: Designed for use with Glen-L Series 6000 boat trailer plans.